What’s up with Camera Firmware? Five photographers, five visions of the world that surrounds us. What is the role of the figure in a landscape photograph? Five photographers, five visions of the world that surrounds us. Despite the diversity of the subject matter and their individual interpretations, the artists are connected by one aim – to look beyond the literal representation and capture the essence of the chosen subject. The exhibition provides a seamless journey through the beauty of the natural and human made world with its variety of colours, ever changing light and extraordinary atmosphere. OXO Tower Wharf, London from 28th October to 1st November. Sue specialises in flower and landscape photography. Her aim is to create an image that goes beyond a simple record of its subject and becomes art, and her compositions are a celebration of colour, light and shape. Her distinctive images are impressionistic and ethereal, with a simplicity of composition, evoking her love of the natural world. “For my part of this exhibition I have chosen to show flower images. Although I photograph many different natural subjects, flowers always draw me particularly with their wonderful variety of graceful shapes and beautiful colours. Charlotte’s ‘trademark’ night and low light photography conveys a mood, atmosphere and emotion which transcends the viewer into another age, long since past. And in contrast to her shots of the city, there is a serene softness to her depictions of land and sea, where the shadows of bricks and concrete are replaced by glowing, salty skies and fog tinged landscapes. “My panel for Vision Five includes a selection of urban street scenes that I have captured in London, Prague and Paris, encapsulating the haunting beauty, intrigue and atmosphere of the night. Drawing inspiration from the work of early 20th century photographers such as Josef Sudek, Brassai and Bill Brandt, I strive to achieve the atmospheric eeriness that envelopes me when I’m standing alone at the dead of night. Beata’s images are distinctive; bold colours and strong composition enable her to perfectly encapsulate the spirit of the places. Versatile and creative, she always strives to get that special image from the mosaic of forms, textures and light. Her love of colour heavily influenced by the paintings of Turner and Monet is strongly visible in her impressionistic photographic works, where longer exposure and intentional camera movement allows her to achieve the smooth, pastel colours conveying forms and emphasising the effects of light. “My part of this exhibition presents a series of photographs that reveal the beauty of the natural world, with a focus on woodlands and the sea. My fascination with both environments is a direct result of my childhood experiences of exploring the primaeval forest of Bialowierza as well as the unspoiled coast of the Baltic Sea and Atlantic Ocean. While emotionally engaging with the woodland, I explore the shadows and light trying to find interesting shapes, textures and rhythm which provide pleasing forms whilst immersing the viewer in my experiences. When capturing sea images I often use longer exposures and intentional camera movement to help abstract away from the literal subject matter; this achieves a mysterious and changeable character that the sea conveys. Vanda is always searching for those fleeting moments of magic that transform our world into something extraordinary. She finds inspiration in quiet scenes and the intimate detail that abounds in nature. In her images she strives to reflect the atmosphere, feeling, and sheer wonderment that our natural world can evoke within us. For Vanda, photography is more than just a recording of where she has been. "It is about encompassing the whole experience of being in the great outdoors, and trying to capture that one special moment that leaves a lasting impression on us. “I have a great passion for landscapes, the coast in particular. Perhaps it comes from my childhood and growing up in an insular country. Even then I felt a great fascination with its infinite power and uncontrollable energy. Moving to the UK almost two decades ago gave me a life changing opportunity to explore its breathtaking coastline. 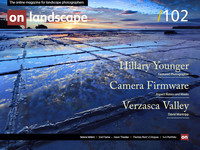 Therefore one of the sets I have chosen for the Vision Five exhibition consists of seascape images taken in England. In my pictures I strive to capture the essence of the sea and its shoreline. I love the experience of standing on the shore, taking in the moments defined by ever-changing weather conditions, times of the day and running tides. It makes me feel alive and gives me a sense of freedom. It is an emotional as well as a physical experience; the sound of the shingle when the waves retreat, the wind, the sea spray and the taste of salt, the surf pounding, the seagulls crying, the light reflecting on the lapping waves. My images are based on my emotional response to this experience. Because I live and work in London I don't get a chance to drive down to the coast as often as I would like to. However I have always believed that there is beauty to be found everywhere and in any weather conditions, even in the city in the rain. Therefore for the second Vision Five set I have chosen images from my project When it Rains. When living in England you need to adapt to the changeable and sometimes fickle weather, including more than an occasional rain shower. I find endless opportunities for capturing images in wet weather; reflections, colours, abstracts, stormy light. Streets come alive with colourful umbrellas, pavements fill up with reflective puddles, windows and glass panes are covered with raindrops, and colours are much brighter and more intense.